I'm entirely happy with your system and staff who took the time to explain that what I had ordered wouldn't suit my purpose. I was able to cancel the order prior to dispatch and the refund was credited immediately. I will use Cable Chick if I need to in future. You can only use one keyboard and mouse at a time, right? Most workspaces become so cluttered that it’s rare you’d have enough room to accommodate two whole computers simultaneously. With two monitors, two keyboards, two mice and possibly two mouse pads as well, there won’t be much room left over for papers, inboxes and other important office work. The answer, of course, is to only use one set of the above mentioned components and just switch between two towers. That’s what a KVM does – it shares your keyboard, mouse and monitor between two PCs. This functionality is great for multitasking in work environments; allowing you to leave one computer to crunch numbers while you continue working on the other - without risking a multitasking nightmare or overload crash. It’s also great if you work from home, because you can have one PC hooked to the internet for business and the other stand-alone for gaming and entertainment – all from the same desk! 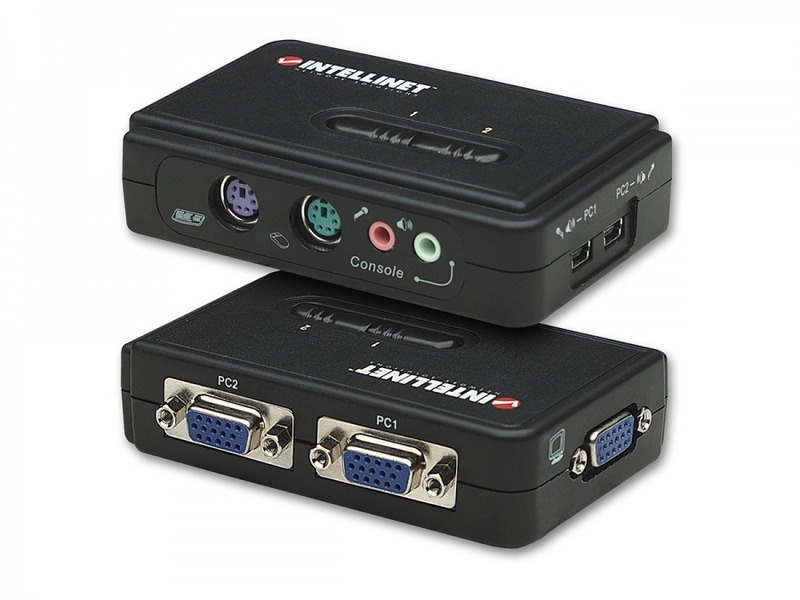 It’ll also handle your video at up to 1600x1200 with its 150MHz video bandwidth. You don’t need any fancy software installations and both computers can boot fully without KVM focus on them. It runs off power supplied via the cables, so there’s no need for an external power supply! An LED indicates the focus state and the entire shebang is hot swappable and plug-and-play. I love these things! Support any mouse including Microsoft Intellimouse, Logitech Net Mouse etc. Hot Swap connected PCs without powering down the KVM switch or PCs. No software required - easy PC selection via push buttons. Answer: "For VGA-based KVMs such as these, it would be easy to add a second monitor with a basic VGA switch box like our product code: SW1442"
Answer: "This KVM is VGA based, which is probably too 'old school' for Windows 10 machines. However, most KVMs, including modern digital KVMs and KVMPs don't require special drivers as they handle all the switching internally. Drivers are only needed for controlling switching via keyboard shortcuts - and only if that function is offered by the KVM switch itself." Service was great and so was the product. Great price too. JB and DSE were way more expensive for a similar cable.